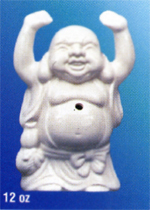 When I was in fourth grade, my best friend Doug went to Jamaica and brought me back a big cup shaped as a “laughing Buddha,” with a hole in the belly button for the straw. A few years later, in high school, my new best friend David and I found it in the back of the cupboard, took it outside, and built a 5-foot high version in the snow. The way I remember it, it turned out really well. When my mom got home later that afternoon, we asked her to get out the camera and take a picture of us prostrating before our newly-built snow idol. But she refused. My mom just couldn’t endorse that, even as a joke–we were worshipping false idols, and the last thing we needed was a photographic record of the crime. I tried to argue, but since this was long before everyone had a digital camera in their pocket at all times, there was nothing I could do. She had the camera, so she held all the cards. Our beautiful snow buddha was a big lump by the next day. I could not have known then that I would, as part of my chosen vocation, go on to do a lot of prostrations in front of a lot of Buddhas. In my 3-year-old son’s mind, that’s my whole job–he knows I do priest-related work and translation work, so the question every day is, “Did you do your gasshō job or your ABC job?” It’s an oversimplification, but there are a lot worse ways to describe what I do. He likes to do gasshō, so he knows I have a pretty great job. I think back to my mom’s reaction, and I see a fear that has since come to feel familiar. She identified strongly as a Catholic, so if you’d asked her way back then if she was actually afraid of the consequences of mockingly bowing before the snowman, I think she would have said, yes, a little. I don’t think she had any illusions about that. But many, many people who don’t identify with any particular religion come to investigate Zen practice and see the bowing and hear the chanting and feel a similar fear, one they probably have a difficult time defining, or even recognizing for what it is. On the surface, this seems fairly reasonable, but is it? What would be the consequences of saying something out loud that we don’t actually agree with or approve of? What if the original message of Daihishin Darani is that it’s fun to do bad things to good people? Here on my desk, I have a book of poems by Pablo Neruda, in Spanish. I don’t understand Spanish, but I get a lot of joy from reading these poems out loud. Even in my comically terrible accent, they’re beautiful to me. Over the centuries, the basic shape of most Zen ceremonies has become something like this: (1) bow; (2) read a sutra; (3) read a “dedication of merit,” offering the merit of having read that sutra to a particular person, or to a category of people, or even to all beings; (4) bow. Sometimes there are additional steps, but that’s the standard outline. Bowing, for many, is a sticky issue, even more so when there’s a Buddha statue in the room. Especially if you were raised in an Abrahamic religion, bowing can feel problematic. Then there are the sutras–there are lots that we understand linguistically, but even then, does it mean that we understand them, really? I have an understanding, but it changes with time; I wouldn’t go so far as to say I really get any of them. What is enough understanding to make something feel safe to chant? And then, on top of it all, there’s this idea of transferring something called “merit” to another person, like sending flowers (if you like something concrete) or maybe just a good vibe (if you think it’s a completely flaky proposition from the start). In that short ceremony, there’s just no safe ground to stand on. For the record, if you think the transference of merit sounds like magic, I agree with you. I don’t believe in it at all. In Buddhism, when in doubt, it’s always good to remember fundamental principles, and for me, the idea of transferring merit from me to you flies in the face of a much more basic idea–namely, that there is no distinct, separate “me” and “you” from the start. It’s very strange that this practice has become so central. My argument for chanting sutras is simple: when we read something out loud, those words temporarily become our own. We become the speaker. When we read the Buddha’s words, then just for that moment, we are speaking as Buddha. We are Buddha, teaching the world. Understanding is secondary, or maybe a fiction from the start. By reading these teachings over and over again, they get into our heads, they become part of the language of our own minds. We digest them in ways we cannot see or ever fully appreciate. In my silly way, I pick up a book and become the voice and the body of Pablo Neruda. Zen offers lots of these opportunities for enactment; we should embrace them. As for something like a darani, it’s a perfect playground for learning to invest ourselves in what we are doing. To read nonsense with full-throated conviction may seem silly, but conviction is conviction; it’s also rare. Most of our lives are spent doing things of no great inherent import, yet this tradition insists that we throw ourselves, body and mind, into each action in each moment. Chanting a darani with everything you’ve got is like committing fully to tying your shoes: on one hand, maybe there’s nothing there, but on the other hand, while you’re doing it, that’s really all there is. Transferring merit is offering–it’s offering everything we have. There’s a very real level of this practice at which we give away every little thing that we do. I’ve been taught that nothing in Zen is symbolic. Nothing means anything other than what it is. If I vow to save all beings, then I make that vow literally–if I tell myself from the start that it’s impossible, but that it’s a nice symbolic gesture, then (a) I’m a liar, and (b) I’m wasting my time. I have to mean it. If I vow to save all beings, that doesn’t mean I’ll get in trouble if I somehow fail. That outcome is a whole other conversation. Success in making a vow is in doing it totally, with complete conviction. I offer myself up, even if I don’t know what that really means. It’s the same with offering merit. I don’t know if this merit exists, and I don’t know if it’s mine to offer. And in my case, I don’t believe it’s transferable, at least not in any personal, transactional way. But in offering it up, I offer up everything–what is mine, what isn’t mine, and what could never be anyone’s. I offer it on the off chance that I can. Nothing is withheld. What is there, in any of this, to be afraid of? When we bow to the snowman, who do we think might be watching? In our heart of hearts, what do we think we might be at risk? This entry was posted in Uncategorized and tagged bowing, buddhism, chanting, daihishin darani, dedicate merit, koun franz, sutra, transfer merit, zen. Thank you. I know for myself, the initial discomfort around chanting and bowing came from an unwillingness to commit–to BE committed. You can’t do a prostration and pretend you’re doing something else, or chant, ‘sort of’. It’s part of our armor, that we don’t do anything whole-heartedly and sincerely- and we’re suspicious of anything that requires that wholeheartedness of us.Something gets expressed, in chanting, bowing, returning merit. Something gets expressed in being suspicious. Thank you. And yes, exactly–at every turn, expression is both inevitable and inescapable.